The current keyboard layout in use by most Malagasy language speakers puts whoever who wants to write in Malagasy at a huge disadvantage. It is impossible to write quickly in their language without stressing out their hand muscles. A typical malagasy sentence is quite often longer than a French one due to word length. Depending on the text sample, It may vary from 7% longer (compare the first 10 verses of the Chapter 1 of the Gospel of John) to 20% longer for more complex texts. A text that had required 10 hours to be written in French will take 11 up to 14 hours for Malagasy. At the scale of a company, or even a country, that is a huge waste of time, mostly due to a legacy that has lost all its relevance as keyboards do not have the same constraints as typewriters. To tell you my story: since I’ve got my Samsung tablet, I’ve almost never used the default Samsung keyboard. So what did write my text messages with? I’m using my own keyboard layout; I’ll show you why and how. This, ladies and gentlemen, is the layout that is currently being used and known by most of the 24 million people in Madagascar. No need to say that their fellow citizen swho have emigrated to France also use it. The problem is that layout is not suitable for Malagasy. At all. Fig.2: Heat map on an AZERTY keyboard used to type in Malagasy. The heat map above has been generated using the Malagasy version of the Rainilaiarivony Wikipedia article. As a Wikimedia contributor, I’ve had the pleasure to type it… using the AZERTY keyboard. It was really a pain, and it looked like you did a lot of effort only to get less than the English version from which I had been translating. That is also felt by my fellow citizens, a lot of whom have taken bad writing habits like writing SMS. That habit is sometimes taken to a new level, so that an unexperimented reader may find difficult or even impossible to read a text written in that SMS-style writing. To palliate this strong disadvantage given to Malagasy regarding keyboard typing speed. I’d been using the German Neo keyboard layout. This was an already good alternative to the QWERTY which I’d been using for 4 years, but it was still sub-optimal, as my left little pinky is above a letter that is never used in Malagasy, my mother tongue. While looking for a solution to my problem I’ve discovered patorjk.com. From a given text, this website basically calculates which keys are most hit while the text is typed. From those keys’ position, a rating will be given. That rating takes into account for 1/3 the distance your finger had moved, how you use your fingers for 1/3 and how you often you have to switch fingers and hands while typing for 1/3. The higher the rating, the lower your hands will have to travel to type the text; so mechanically you’d be less tired typing the text in an optimal keyboard than in a standardised one. The loser here is clearly the AZERTY, used by most of my fellow citizens. The standardised Dvoraks are good candidates for typing Malagasy, and maybe we should consider those keyboards since they are widely supported in modern operating systems. Well, to say the least, it looks like I’ve done way more than what the algorithm had succeeded to find. 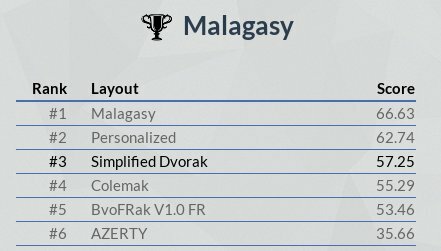 I’m pretty sure the layout I’ve designed is not very far from the perfect Malagasy-optimised Dvorak. Let’s go further into the report and see the row usage comparison. Fig. 10: Row usage comparison. Yes, the AZERTY is an absolute typist horror when it comes to Malagasy. 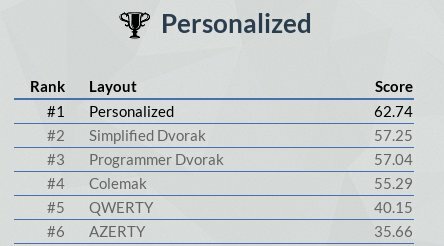 The use rate of the home row for the our Malagasy keyboard is not very far from the optimal/personnalized layout generated by the algorithm. Fig. 11: Hot keys on the second attempt. Well, after a few day testing the keyboard layout I’ve got on the first attempt, I’ve felt some mandatory re-tuning of the optimised keyboard. That implied moving some keys to get the hot ones (the ones I have to hit most to type down my text) right under my index and my right middle finger. Since the left finger almost always type vowels, I’ve made them stay as most as possible at the home row unless you want to type some foreign words – in which case you’ll have some gymnastic to do. Fig.12: Finger usage of various keyboards. As shown in fig. 12, the total number of hits in the Rainilaiarivony article is distributed as such: ~53% for the left hand and ~47% for the right hand. This excludes the thumb hitting the spacebar. We’re getting better. Though the article is the same, I’ve switched to selecting the article from its HTML form. Since working on the article over and over again may constitute some bias, I’ve tried using some text samples from the Sarasara Tsy Ambaka. Fig. 14: Layout ratings comparison. Fig. 15: The calculated layout. Looks a bit familiar, right? 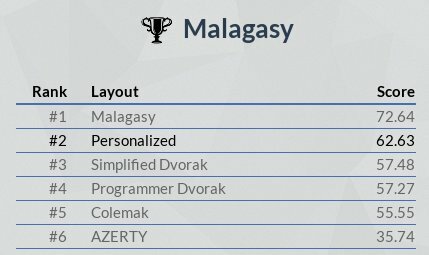 As of this second version, we have an fairly optimised layout for Malagasy language, i.e. you’ll gradually type faster as your hand muscles get used to the new layout. Even for typing other languages such as French, this layout surpasses the AZERTY as the latter keyboard layout had been initially made to avoid the jamming of typewriters. I may never say it much enough: the AZERTY keyboard is the absolute worst keyboard to type Malagasy with. Even the QWERTY does better. The Dvorak is a pretty good candidate for a widespread “more ergonomic” layout due to its presence in all modern widespread operating systems, but there is better. Even if the French have designed the BÉPO layout for their language, it has failed to replace the omnipresent and inherited AZERTY slow layout. There is only one person I know who uses it on a daily basis. We also have to add to the fact that BÉPO has been around since 2008 and the Klavie Malagasy (“Malagasy Keyboard”) has only been written about just now, in 7th November 2016. As heavy as it is, the legacy left by AZERTY is highly likely to continue to be used in Madagascar probably for decades as long as keyboard typing exists, even if we relevantly know that the AZERTY layout is totally unsuitable to write French let alone Malagasy. Right now I’m typing this article in English on a QWERTY keyboard. I’m planning to translate it to Malagasy as it gets more complete in order to reach more of the target audience. I’ve already implemented that layout on my tablet so I’ve got all the time I need to adapt my fingers from the old Neo layout to the new Klavie Malagasy. Attached a PDF file containing the test corpus. A slightly better version has been proposed in the comments (thanks Ian! ); and even though it has lower score than the v2.0, it has a really awesome idea of putting the T on the home row. To better track all the changes, the project now has its own repository on Github. Long live open source! Ity lahatsoratra ity dia dikanteny amin’ny teny malagasin’ny lahatsoratra nosoratako tamin’ny teny anglisy vao andro vitsivitsy izay. Mandray anjara tamin’i Wikibolana aho nanomboka tamin’ny taona 2010. Lasa fahazarana ilay izy: isam-bolana,isan-kerinandro, isan’andro, ary isa-maraina na isa-kariva, dia alefako ny mpitety tranonkala ijerena izay zavatra nitranga teo amin’i Wikibolana, ary mijery ny zavatra izay azoko atao mba hanampiana votoatiny be kokoa. Tsindraindray dia tena manam-piniavana ny hanampy fampahalalana iray amin’ny pejy maro aho ka mandany ora maromaro manoratra fandaharana hanampiana izany amin’ny fomba faran’izay haingana. Ary tsindraindray aho dia tena tsy tia handray anjara, ka mijery ny fiovana farany sy mijery ireo pejy izay mety nosimbaina aho, na mijery ireo pejy novain’ny mpikambana hafa. (1) Manoratra pejy amin’ny tanana. Zavatra mora indrindra atao na dia zavatra mahavizaka indrindra amin’ny voalaza aza. Manomboka nanoratra pejy amin’ny tanana (amin’ny alalan’ny fitendry) avokoa ny mpandray anjara rehetra, ary mety ho toa izay hatrany mandritra ny telopolo taona. Amin’ny 2045, dia ho lasa tola ny Wikipedia na i Wiktionary amin’ny endriny ankehitriny raha tsy efa manova ny votoatiny ho azy. (2) Manoratra fandaharana manoratra pejy izay mety ilaina ahitsy rehefa aty aoriana. Mora izany, ka niezaka tamin’izany aho nandritry ny telo taona. Rehefa mandeha ny fotoana dia betsaka ireo pejy voaforona, ka na dia kely aza ny taham-kadisoana dia lasa betsaka ireo pejy misy hadisoana. Ekena izany, fa betsaka noho izany ireo pejy tsy misy hadisoana. Rehefa ampiarahana amin’ny rakibolan-teny mitovy hevitra sy fahaiza-manodina teny voajanahary (Natural language processing) dia afaka mampamaritra teny tsy afaka dikaina amin’ny fiteny tanjona ianao. (3) Manoratra fandaharana mamaky gazety ahitana ireo teny sy pejy tsy misy. Rehefa feno ny rakibolana dia mihasarotra hatrany ny fahitana teny vaovao hoforonina. Mety tsy hanam-piniavana ny hamaky lahatsora-gazety am-polony ianao, ka manorata fandaharana hamaky azy ireo ho anao ary maka ireo teny tsy ampy ho anao. Rehefa vita izany dia manorata fandaharana mitady ireo teny nakambana rehefa ary hanampy azy ireo ao amin’i Wikibolana. Ny lenta eo ambonin’izany karazam-pandaharana izany dia mpitady teny mivantana mamaky fahan-tsoratra avy ao amin’i Twitter ohatra, ary mametraka ireo teny rehetra tsy mbola voafaritra ao amin’i Wikibolana amin’ny faran’ny andro. Zavatra iray ny mianartra manoratra fandaharana, fa zavatra roa samihafa ny fanampiana fampahalalana ary ny mahafantatra hoe fampahalalana inona no tsara ampiana. Rehefa mitsiry ny hevitra, na misy angona mikasika ny teny mahaliana eo am-pelantanana dia manorata fandaharana hametrahana ireo singam-pampahalalana ireo amin’i Wikibolana. Ataovy am-panajana ireo zom-pamorona izany. (4) Mitety rakibolana ary manampy teny tsy fahita matetika. Mahaliana anao ve ny etimôlôjia? Am-pianarana teny vaovao ve ianao? Misy ao amin’i Wikibolana ve ireo teny ireo? Aza misalasala fa ampio ireo teny ireo. Atao am-panajana zom-pamorona foana izany. Azo heverina hoe asan’ny tena ny fakana teny maro avy amin’ny rakibolana maromaro, fa aza mandikadika foana ny famaritan-teny. Nanao izany aho ary saika voatory noho ny fitarainan’ny tompon’asa. Raha havanana amin’ny haranitan-tsaina voatrolombelona (AI) sy fahaiza-manodina teny voajanahary ianao dia manorata fandaharana mandika fehezanteny. Mahery ny fandaharana. Betsaka ny fotoana ilaina amin’ny fanoratana fandaharana tsara, ka tsy vonona ny hianatra izany ny ankamaroan’ireo mpandray anjara, ka inna ny atao? (5) Manorata amin’ny Wikibolana amin’ny teny nibeazanao. Raha atokantsika ny teny angisy dia soratana anaty fiteny 170 ny Wikibolana. Betsaka amin’ireo no manam-pejy latsaky ny iray hetsy. Vokatry ny finiavako ny hamorona ny rakibolana lehibe indrindra amin’ny teny malagasy ny haben’i Wikibolana malagasy amin’izao fotoana. Raha tsy teny anglisy no eny nibeazanao, dia mianara teny vahiny ary ampio ny teny ampiasainy, na ao amin’ny Wikibolana na aiza na aiza. Raha tsy mahaliana ana ny fianarana teny vahiny dia ampio ireo tenin-jatovo tsy mbola hita amin’ny teny nibeazanao. Since 2010, I’ve been contributing to the Malagasy Wiktionary. It has become a habit now: every month, every week, every day, and almost every morning and evening, I turn on the web browser to check what’s going on on Wiktionary, and what I can do to add further content. Some days, I get so interested in adding some pieces of information that I feel like writing a program to add it in the next hours. And some days, I don’t feel like contributing, and them I’m just looking at the recent changes to check if pages have been vandalised in my absence, or if some pages have been fixed by other users. (1) Write pages manually. This is the most basic yet most tedious work to do. This is how everyone start, and this will is how most of us will contribute probably for the next 30 years. In 2045, Wiktionary or even Wikipedia in its current form will probably become obsolete or be self-editing. (2) Write a program that writes pages that you may need to fix. Simple, since the last three years, I’ve been concentrating on how to do this. But as time passes a lot of pages get created, and even with a lot rate of error, you end up with thousands of pages of potentially wrong information. OK, but you also end up with even more pages with correct information. Coupled with synonyms dictionary and advanced NLP you can have it write definitions of words that can’t be translated directly to the target language. (3) Write a program that reads newspapers to find the words to be created. With a very complete dictionary it gets difficult to find missing words. You won’t have the will to read dozens of newspaper articles every day, so have a program read them for you and find all missing words for you. After that, write a program to detect all compound words and add them to the Wiktionary if you feel like it. The next-level of this kind program would be an almost-real-time word scraper which analyses text flow for e.g. Twitter and lists all missing words at the end of the day. Learning to code is one thing, but adding information and know what piece of information to add are two different things. Whenever you have an idea, or interesting lexicographic datasets under your eyes, get to code and add those bits of information to the Wiktionary. Do so in compliance with copyright laws. (4) Navigate through dictionaries and add exotic words. Passionate about word etymology? Are you learning a language? Do the words not exist in Wiktionary? Feel free to add them. Always do so in compliance with copyright laws. Compiling several dictionaries and definitions may be attributed as original work but never do verbatim copy of word definitions. I did this one time and almost get sued because of a complaint of a copyright owner. If you feel you’re good enough in AI and NLP, write a program to reformulate and translate the sentences. Code is strong, code is powerful. It requires a lot of time to write good one. It requires a lot of time to become good at coding, and not everyone feels like learning it. So what to do? (5) Contribute to your native language Wiktionary. English put apart, Wiktionary is written in 170 different languages. A huge number of them have below 100,000 pages. Malagasy, my native tongue, has 3.75 million only thanks to my efforts in trying to create the biggest dictionary in Malagasy that has ever existed. If your native language is English, get interested in other languages and add new words in them, be it at the English Wiktionary or elsewhere. What, you are not passionate about languages? Add obscure English slang terms then. Good news, if it can be said, for my fellow Malagasy citizens: Since 6th of December 2014, Google Translate has been allowing them to see almost any web page in their mother tongue in addition to 89 others. Many people, myself included, have been waiting for this moment that would have come sooner or later. First of all, I would like to address a big thanks to all people that have made this possible. Thanks to you, the Malagasy language is getting further integrated into the polyglot Web world. You’ve also given a chance to the 15 million monolinguals to have an approximate understanding of what other people have written using other languages are writing. Before we’ve got Google translate to translate almost anything in our language, including curse words, several websites have helped us Malagasy and other language enthusiasts to write corpora in a proper way in our mother tongue: many of us have already heard about Freelang, tenymalagasy.org and so on. The only drawback of these website is that they do not work in a collaborative way: they are not «crowdsourced». Wikibolana is a Malagasy language crowdsourced dictionary, but I have been so far the one that has generated most of its content. Well, let’s be honest: absolute accuracy has been the motto for no machine translation system ever. But for a brand new language on Google Translate, Malagasy is… quite good. Daring to translate a language with such an unusual syntax like Malagasy is already a huge challenge, a challenge worth to be accepted. At first sight, idiomatic sentences and expressions are fairly well handled. Still when it comes to very complex sentences, it is a mess: verbs are at the wrong place, which either gives the sentence a completely different meaning, or makes it look like an incomplete sentence. There are also some fails as the one in the screen shot below. Original in English In 2012, the population of Madagascar was estimated at just over 22 million, 90 percent of whom live on less than two dollars per day. Malagasy and French are both official languages of the state. […] The island’s elephant birds, a family of endemic giant ratites, went extinct in 17th century or earlier, most probably due to human hunting of adult birds and poaching of their large eggs for food. Google-translated in Malagasy (as of December 2014) Tamin’ny 2012, ny mponina ao Madagasikara dia tombanana ho 22 tapitrisa mahery kely, 90 isan-jaton’ny izay [no] miaina amin’ny [vola] latsaky ny roa dolara isan’andro. Malagasy sy Frantsay dia samy fiteny ofisialy ao amin’ny fanjakana. […] Ny nosy vorona ny elefanta, ny fianakaviana ny fizahantany ratites goavana, dia efa lany tamingana tamin’ny taonjato faha-17, na teo aloha, indrindra noho ny olona angamba ny olon-dehibe ny fihazana sy ny vorona lehibe Fihazana ny atodiny ho sakafo. The green-coloured sentences are syntactically correct without correction. The first one has required the red words in square brackets to sound correct. The third one hurt my brain: “The elephants are a bird island, the family of big tourists, have gone extinct in 17th century, or before, perhaps because of people, adults, hunting and adult birds who have their eggs hunted for food.” It hurt to understand, and also hurt to back-translate. Astonishingly making a round-trip translation has given a correct sentence in English, so please always have your translations checked human translators. One can take part to increase translation accuracy by translating articles by using the Google translator toolkit, or by using and correcting translations provided by Google translate itself. Do you want to switch to Linux? Before doing so, I invite you to reconsider all implied consequences of a switching to another operating system. But in the first place, what is Linux? It is the kernel of the GNU/Linux operating system. To be frank with you, «Linux» is a generic name for a few dozens of distributions having one thing in common: the Linux kernel. What is a kernel? It is a software that manages your hardware (motherboard, CPU, hard disk, networking, etc.) to make it work with applications you use. Current Microsoft Windows’ kernel is NT. By the past it also had MS-DOS which was the kernel used for Windows 1 up to Windows ME. I can write about this longer, but then we’d be off-topic. So, Linux is an operating system, competing with Windows. It has to be known that Desktop computer market is the «final frontier» for Linux. All desktop computers nowadays come with Microsoft Windows pre-installed. Because they use different kernels, Windows’ software will not work on Linux. There’s still a (poor) workaround for this problem, but I’ll talk about it later. This is also a blessing because Windows’ viruses can’t run on Linux whatsoever. I’m not saying Linux is totally clean of viruses – because people have already created viruses that have successfully infected a Linux system – but still, with right reflexes, you’ll avoid most of problems. The most basic tip is to never run a Linux-based system as a root user, unless you know exactly what you’re doing. You can still run tasks requiring root privileges by using your own user password, but it will mostly happen when you install programmes. Primarily, Linux distributions can be used legally free of charge, by anyone. This means you don’t need to install an «anti-product activation » thing picked from a weird site, to use your operating system at will. The latter action, often performed by Windows users, is not only illegal, but can also compromise your security by letting that weird software from a weird site dig «holes» (backdoors) in your firewall. For people who like doing computer DIY, Linux is also open-source, developped by a community counting thousands of programmers an code reviewers. Have you found a bug in the software? You have the freedom to patch it and share your patch to other people. Yes, Linux licence allows this. You also have a vast array of choices regarding distributions (commonly known as «distros»). Linux distros are all built to do things in a certain way, so you have to think about what you’ll be doing with the OS, and then you download the distro that fits your needs. It is not like Windows, where you first install your OS, and then figure out what you need. All distros (eleven) have their own software repository and desktop environment (DE) but they all have something in common: the Linux kernel, hence the generic name. By May 2014, the most recent version is 3.14 issued two months ago. Something that discriminates each distro is at first sight their desktop environment, then the default software. Ubuntu itself has six desktop environments (Edubuntu, Kubuntu, Mythbuntu, Ubuntu Studio, Xubuntu, Lubuntu). Depending on your taste, you choose your DE: Unity has a very «modern» appearance; KDE is a very flexible desktop making it look almost like what you want it to (you can even rotate icons on the desktop! ); LXDE offers a lightweight DE as well as XFCE. About updates, they are done through an update manager. Also, most of distro issue a new version every year. So you’ve finally decided to switch. Your CD is burnt (or your USB key is configured), and you are going to shut down your PC. Please don’t do it yet, there are some matters to be thought about : do you use specific software for your videos? Do you play games? Have you some specific hardware for which installation requires a driver burnt on a CD? To answer these questions, you’ll have to do some research on the Web. If you use frequently used software, then it is likely to find a free and/or open-source equivalent on some distro. If you use something like AutoCAD or Photoshop, then you’ll still find «free» equivalent of these on Linux, but they won’t always be as powerful. Furthermore, chances are that Photoshop format will not be compatible with their free equivalents. About games, forget about playing Call of Duty, Battlefield or League of Legends on Ubuntu. The Steam Machine is on its way, so gaming will soon be possible and be more and more common on Linux. If you cannot separate of your Windows software, there’s still a workaround: Wine. This piece of software allows you to run simple programmes on Linux. It is not guaranteed that everything will work on it, but still, it’s better than nothing. If you depend on a Windows-OS-only software to do your business, I advise you to dual-boot your computer. Then you’ll have and a Windows OS to run your software and a Linux distro to do your things as well. Note that Windows files can be accessed easily from Linux, when the opposite requires you to download software, and mount manually Linux partitions from that software. It is the way most people do when switching to Linux, avoiding all the inconvenience of having data requiring to be backed-up on another HDD. Your hardware has come with an installation CD? The best way to proceed in this case is to check if the distro you’re going to install will support it. Still, the best way to know if the distro you’ve chosen fits to the hardware is to boot using the CD which is most of the time a Live CD. Live CDs allow you to test the operating system on your computer without changing anything a single byte to the hard disk drive, as every required data is charged into memory. You can then choose to install the OS on your hard drive once you’re satisfied by the OS behaviour on your computer. If you decide to switch, take the time to check if you’ve successfully backed-up all your data. We never know if something is going to fail, and to have twice the same data is always better than not having the data. If you can’t somehow migrate your data because you don’t have an external HDD, you can still choose to dual-boot your computer, so you’ll still have access to your data stored on the Windows NTFS (or FAT32, or FAT) partition. You can even choose to install your OS in an external HDD, if you need all the space on your computer HDD for your data. But to boot, do not forget to plug-in the USB key ! Usually, installation won’t take a long time. To install Kubuntu 12.04, I only needed 50 minutes to format the entire disk (500 GB) and get the PC ready for work. Because I got fed up by the inefficiency of my (free) anti-virus programme and by Trojans, key-loggers and root-kits compromising personal data security (my credit card number somehow leaked when I made an online purchase on a well-known financial transaction platform), I decided to make the big switch by changing the OS of my 4 year-old laptop computer to some Linux distribution. Because I do care a lot about hardware support and user-friendliness, I’ve taken the decision to choose Kubuntu 12.04, first because it is a long-term support version (i.e. updates will be done on this OS for 5 years), and secondly because I am familiar and have positive experience with Ubuntu distros in terms of hardware support. I made the switch a month ago by changing my laptop OS from Win7 to Kubuntu 12.04. The most annoying thing I’ve had to face since the switch is (still) hardware support. If your hardware is a little complex, crap happens quite a lot. Before definitely switching to Kubuntu, I tried Ubuntu (unity desktop), Mandriva (now OpenMandriva), Mint, Mageia and Debian. The latter three were unable to support my networking hardware, and (perhaps I have deficient research skills, but…) I found no workaround for it. Same problem for my printer. My connected printer refuses to do its job when I order it, which is quite frustrating to the average user. When the switch has been complete, I noticed that Kubuntu – or at least the 12.04 version – has a serious memory leakage problem: kded4 process occupies more and more memory as time passes, and after a week of activity it ‘eats’ up to two gigabytes of memory. The PC then gets slower and slower, making it totally unusable so I’ve had to find a workaround to make the inflation cease. The price of this has been the inability to make the PC sleep, which reveals to be quite impractical, especially when you are working outside without an accessible plug to help your laptop keep the charge. Even if Ubuntu support fairly well all the laptop’s hardware, some hardware problems still arise when you don’t expect them: I wanted to make an Ad-hoc connection to a friend’s laptop, but Kubuntu prevented me to do it because of kernel bugs. Also, a friend of mine had a Ubuntu 12.10 version and I was really astonished to see a so unstable Ubuntu version: random errors pop up every 10 minutes! I finally advised him to install another version. Despite the lack of hardware support, switching to some Linux distribution is something great, especially when your hardware can’t support the latest Windows version. Also, for people who don’t want to invest tens of euros (or dollars) in an anti-virus solution, it is also a good choice. Don’t Switch to Linux : In this (also long) video, you’ll find comments and tips from people who have already switched to Linux for years. Author terakasorotanyPosted on May 31, 2014 Categories EnglishTags computer science, linux, operating systems, ubuntu, windows1 Comment on Switching to Linux: good or bad choice? Amin’izao fotoana izao dia ohatry ny maro ireo mpiteny malagasy kivy ratsy amin’ny fomba fanoratan’ny sasany ny tenin-drazany eo amin’ny Aterineto. Na aiza na aiza aho mamaky dia mahita olona mitaraina mikasika ny tsipelina foana aho, na amin’ny teny anglisy, na amin’ny teny frantsay, na amin’ny teny malagasy. Inona ny nahatonga izany? Voalohany indrindra aloha, dia mba aoka aho hanolotra ny tenako (ho an’izay tsy mahay miteny anglisy). Izaho dia mpianatra amin’ny fianarana ho injeniera amin’ny kajimirindra (informatika). Roapolo taona mahery aho, olom-pirenena malagasy, monina eto Frantsa, ary mpandray anjara eo amin’ny tetikasa Wikimedia amin’ny teny malagasy. Amin’ny maha-teknisianina ahy, dia misy fanazavana voalohany amin’io tsipelina tsy manajahaja ny fiteny io. “Tsy haharitra mandrakariva ny fomba famaritana zavatra iray. Tsy haharitra mandrakariva ny anarana amaritana zavatra iray.” hoy i Laozi. Tsy diso izy. Efa hita fa samihafa amin’ny teny malagasy ankehitriny ny teny malagasy notenenina tamin’ny andron-dRadama. Ary azo inoana mafy fa ho samihafa amin’ny teny malagasy ankehitriny ny endriky ny teny malagasy afaka 200 taona. Mety hitranga arak’izany ny fahatsorana ara-boambolana ary ara-pitsipi-pitenenana : mety hanisa amin’ny fomba mahitsy (toa ny fiteny tandrefana, na ny fiteny sinoa) isika ; mety handrafitra abidy vaovao izay tsy misy fifandraisana amin’ny abidy efa mahazatra antsika isika. Mety hiova lalina ihany koa ny fomba fanononana, ary torak’izany ny fomba fanoratana. Andinini I : Nateraka hu afaka si hituvi ni ulumbeluna rehetra na eu amin’ny zu na eu amin’ny hasina. Sami manan-tsaina si fieritreretana ka tukuni hifampitundra am-pirahalahiana. Tsy hanova ny tsipelin’ny teny tsy misy ny litera “y” sy “o” sy “j” io abidy malagasy tadiavina ny hanolo ny abidy taloha io, satria hivadika “dz” ny “j” rehetra amin’ilay abidy. Torak’izany koa ny “y” hivadika “i” na aiza na aiza, ary ny “o” hivadika “u”. Mitovy amin’ny mahazatra ihany ny fanononana, fa ny fomba fanoratana ny teny fotsiny no ovaina kely. Tokony efa nahatsikaritra izany ianareo : inona ny mampiavaka ny teny tsidio ary tsidiho ? Tsy misy. Samy mitovy ny fomba fanononana ireo teny roa ireo, satria tsy tononina intsony ny /h/. Ity indray mbola misy hafa : inona ny mampiavaka ny teny may sy mahay ? Ho an’ny ankamaroan’ny olona, dia tsy misy. Fa ho an’ny olona sasany, dia misy ilay izy, na dia kely fotsiny aza. Ohatra fahatelo : iza no tena marina: mande sa mandeha? Raha “mande” no voafidinao dia diso ianao, na dia /mande/ aza no fanononantsika ilay teny “mandeha” ankehitriny. Ny fanovana kelikely ohatr’izany no mahatonga ny teny mivoatra. Ary mety ho tian’ny olona izany, na mety tsy ho tiany ihany koa. Manana ny fiantraikany ihany ka ny fanatontolona amin’ny teny malagasy. Ny mahatonga ny tanora ohatra anay miteny vary amin’anana amin’izao fotoana izao dia anisan’ny vokatr’io Fanatontolona io ; manomboka avy any amin’ny fara tampon’ny Fanjakana ny ohatra, ka haninona ny mponina no tsy hanaraka? “Ni-inviter anareo Tantsaha iray génération amiko aho, mba hiara mi-étudier ity projet de développement nanaovako étude plus ou moins approfondie ity. Mi-concerner ny région-tsika mantsy izy io, ka tokony hi-sensibiliser-na antsika masse paysanne amin”izao période de décollage économique izao. Ny cohésion sy ny participation de tout un chacun anefa no tena primordiale amin”izany, ka tsy ny élites sy ny intellects ihany no ho décideurs sy piliers amin”ny réalisation sy ny exécution-ny, fa ny population active sy isika izay avenir-n”ity tany ity. Raha tsy izany, tsy avotra izao situation déplorable sy catastrophique izao. Mila straté ;gie sy plan triennal bien au point anefa izany fa tsy azo atao au pif fotsiny. Izany no ni-convoquer-na antsika exprès amin”ity réunion de sensibilisation ity. Isika rehetra sans exception izany no samy hilaza izay point de vue-ny avy, vis-à-vis de ce projet. Tout au moins, izay mba suggestion na solution intermédiaire sy adéquate any an-tsainareo any. Mety hankarary ny sofin’ny sasany ny kabary tahaky ny teo ambony, ary mino aho fa tsy mety nanao kabary tamin’ny tantsaha intsony ilay rangaha diso fanantenana tamin’iny tsifahombiazana iny. Vao nivoaka tamin’ny fangasiana ny Malagasy tamin’izany fotoana izany, ka naverina ho teny frantsay indray ny teny enti-mampianatra. Na dia izany aza, dia azo lazaina fa diso kajy ihany ilay mpandaha-teny satria dia noheveriny fa nahay teny frantsay hoatr’azy daholo ny iray trano. Amin’izao Fanatontoloana vokatry ny Aterineto ary ny fifanakalozan-kevitra iraisam-pirenena izay atao amin’ny teny anglisy izao, dia manomboka miditra ao amin’ny teny malagasy (indray) ny teny anglisy. Saika tsy misy fanagasiana ohatry ny tamin’ny taloha fa tonga dia miditra manta tsotra izao : crowdsourcing, cloud computing, outsourcing, manager, sns. Hoy ny sasany : “Andrianiko ny teniko, ny an’ny hafa koa feheziko”. Teny malagasy ihany no misy ao Madagasikara, ka raha manomboka miteny vahiny ianao dia ohatry ny lazaina hoe manam-pahaizana be. Zava-dehibe amintsika malagasy ny fahaizana, ka izany no mahatonga ny lamaodin’ny sasany “miteny vary amin’anana”. Azo lazaina fa tafaverina tsikelikely amin’ny fampiasana teny malagasy madio indray isika malagasy amin’izao fotoana izao, na dia mbola tsy ampy tsara aza ny ezaka. Inona ny hevitrareo mpamaky mikasika ny ho avin’ny teny malagasy? Rehefa mandroso ny taona dia mahatsapa aho fa hoatry ny mihahaingana hatrany ny fandrosoan’ny fotoana. Efa lasa sahady ny taona 2013. Tsy hitahita akory dia efa folo taona mahery izay no nialako an’i Madagasikara. Roapolo taona tamin’ny volana Jolay aho. Inona sisa no tavela tato an-dohako tamin’iny taona 2013 iny? Andao ary isika hanomboka amin’ny fihatombohany. Efa mby hifarana ny taona 2012. Taiza aho? Lasa nanao reveillon niaraka tamin’ny raiamandreny tany amy tanàna izay tsy fantatra intsony ny anarana. Tany aho no nankalaza ny fahatongavan’ny taona 2013. Tamin’ny volana Jolay 2012, nanoratra lahatsoratra momban’ny fara andro izay noheverina fa hitranga tamin’i 21 Desambra 2012 aho, tamin’ny teny anglisy. Na dia betsaka aza ny zavatra nalefa teo amin’ny fahitalavitra momba io daty io, dia kely finoana ihany aho, fa na dia izany aza, tsy nanakana aho ny hanoratra scenario ho an’io daty io aho : iaraha-malala koa fa tena henjana be ny toe-javatra ara-toe-karena tety Eoropa tamin’izany fotoana izany. Tsy izay irery no tena nanaitaitra fa nisy koa ilay vinanin’i Web bot, izay mambara fa ho fara andro ny 21 Desambra 2012. Tamin’ny voalohany dia teo amin’ilay lahatsoratra teo aho no namoaka ilay hevitra ary nanitratra azy teto amin’ity blaogy ity. Rehefa dilatra ny 21 Desambra, dia tsy hay intsony izay vaovao momban’ilay Webbot izay milaza fa maminany fara andro izay. Rehefa tonga kosa ny 2013, ary tsy nisy zavatra manokana nitranga. Marina fa betsaka ireo olo-nalaza maty. Tamin’ny faran’ny volana Janoary, nitady orinasa hiofanana aho, ary nahita tapa-bolana taorian’izay. Orinasa miasa amin’ny kajimirindra izay orinasa izay ary ny tena ataony dia mamorona rindrankajy hanaovana sary ary hanaovana piesy mekanika. Na dia mahay manao fandaharana informatika aza aho, dia tsy mora ny zavatra niandry ahy tany. Nandritry ny roa volana sy tapany, dia manao 80km isan’andro aho mandeha lamasinina. Na dia betsaka aza ny zavatra nianarana, vizaka ihany ny vatana rehefa ela ny ela. Rehefa vita ny fanolorana am-bava ny tatitra (frantsay: soutenance) dia “fialan-tsasatra” no teny voalohany tonga tato an-tsaiko : tapa-bolana aho tsy nanoratra fandaharana na inona na inona amin’ny fiteny fandaharana C na Python na amin’izay fiteny rehefa voafehiko. Tsy nahaforona lahatsoratra teo amin’i Wikipedia koa aho fa tena leo niasa. Rehefa nifarana tokoa ny taona ary rehefa azo ny mari-pahaizana dia nangataka fianarana hanohizana ny fiofanana. Tao amin’ny Oniversiten’i Versailles, ary tao ihany, aho no nametraka kandidatiora. Tamin’ny volana Septambra vao nivoaka ny valin’ny kandidatiora : voalà – tsy mahazo miditra. Ny fianarana amin’izany efa miditra daholo, ary vitsy ireo fianarana mbola mandray mpianatra. Notetezina daholo ireto fianaran’i Île-de-France, fa mbola tsy nahita foana. Na dia izany aza, nametraka kandidatiora tao amin’ny fianarana ho injeniera aho, fa kely finoana ihany aho tamin’iny satria efa niditra ny mpianatra. Nisasaka ny volana Septambra ka mbola tsy nisy namaly ireo fianarana hafa nametrahako kandidatiora. Na dia izany aza mbola nisy ihany ny fanantenana satria efa fantatro fa ho BAC+3 aho farafaharatsiny (nametraka kandidatiora tamina lisansa profesionaly aho, ary fantatra fa ho voaray na inona na inona mitranga). Kinanjo tonga ny valin-kandidatiora napetraka tatsy amin’ilay fianarana ho injeniera : voaray tao aho. Nanomboka telo andro taorian’ny valin-kandidatiora ny fianarana ary tsy nisy fianarana tokony nenjehina. A few months ago I wrote an article which summarises my history on the Malagasy Wiktionary, and more generally my history on Malagasy language Wikimedia projects. I am back here to write a short summary recapitulating the current progression of African language WMF projects. In this article you’ll learn about the current stage of African language projects and their trend. In terms of community size, the biggest African-language community is the Afrikaans language Wikipedia community; followed by Egyptian Arabic speaking community and Swahili speaking community. If we look closer to the statistics. The award goes to the Afrikaans language Wikipedia community which has 7 to 8 very active contributors (performing more than 100 edits per month). The Egyptian Arabic Wikipedia community counts 2-3 very active contributors, which is big for an African language but very small comparing to Standard Arabic community counting more than twenty times more active users (83 very active users in June 2013), most of them being Egyptian contributors. About Swahili, the number of very active users is one to two. On a 2-year term, this number can be averaged to 1. But the number of active users (i.e. making more than 5 edits per month) is 9 in average, which is a fine thing for a language that is spoken in countries where internet access is quite hard. These numbers were obviously averaged from July 2011 to June 2013, so it smoothes short-term variations. In terms of raw article size, the biggest African language Wikimedia project is the Malagasy Wiktionary – which currently counts 2.5 million articles, only smaller than English and bigger than French! – , the Malagasy Wikipedia (40,000+ articles) and the Yoruba Wikipedia (30,000+ articles), followed by the Afrikaans and the Swahili language Wikipedias (respectively 27,000+ and 25,000+ articles). The Malagasy Wiktionary balecame very big for reasons you can read here, the Malagasy Wikipedia is big thanks to geography articles (~20,000 articles) and celestial objects (~8,000 articles); the Yoruba Wikipedia is made big by articles about people and also celestial objects (~15,000 objects). Many Wikimedians who consult the statistics should know that the number of content pages does not determine the quality or the comprehensiveness of an encyclopedia. Judging wikis by article count is like judging a book by the appearance of its cover. And many book readers and critics know that looking at the cover is not enough to judge a novel. Here, by its raw size, the Malagasy language dominate in the two biggest projects (Wikipedia and Wiktionary) but that doesn’t mean it has a very active community. To judge about the quality, comprehensiveness and completeness of the articles of such wikis, it is better to dive into this kind of statistics where scores are given by the absence/presence of vital articles and the size (number of characters) of such articles (if they exist). That kind of statistics are better than article count and page depth which can be inflated by the use of bot and the generation of tons of non-article pages (talk pages, subpages, redirects…). According to the List of Wikipedias by sample of articles, the best scored African language Wikipedia is the Afrikaans Wikipedia, which ranks 58th and the Swahili Wikipedia (79th) followed by Egyptian Arabic, Yoruba and Somali Wikipedias. Malagasy Wikipedia is quite far behind and ranks 155th which is only higher than Lingala (161st), Wolof (175th) and Shona (187th) Wikipedias having less than 5,000 articles. Which means article count is only the cover of the book and thus some efforts have to be done there to make Malagasy Wikipedia more comprehensive. Less than a year ago, some Wikipedias found a way to grow in number of article thanks to species databases. The first ones I saw to grow this way are Winaray and Cebuano Wikipedias. Winaray Wikipedia gained 100,000 articles primarily thanks to low quality geography stubs (consisting in one or two sentences), and secondarily thanks to articles about species, animal and vegetal ones, making it to have 510,000 articles. Cebuano has more than decupled in article count within the last 50 weeks, from 40,000 to more than 500,000 articles. This mania of creating article about species has propagated to Swedish and Dutch Wikipedia which has recently surpassed the German Wikipedia, and in response to that, the latter Wikipedia seemed to have boycotted the Dutch Wikipedia, by deleting the link to the Dutch Wikipedia in the German language Wikipedia main page. Now let’s write about the growth trend of African language Wikimedia projects. First off, let’s talk about Wikipedias, then Wiktionaries and finally other «minor» Wikimedia projects. (1) Calculated following this site, data retrieved in July 26th 2013. On Wikipedia, the growth is slow comparing to other languages spoken in developped countries, where Internet access is easy and unexpensive to the normal citizen. The African language with the biggest community grows at approximately 5,000 articles per year, which is fairly high comparing to Swahili which growth is almost twice lower. If the current trend continues, the Afrikaans Wikipedia will surpass the Yoruba language Wikipedia next year, and the Malagasy Wikipedia in the next 2 years, as the two current biggest Wikipedias are stagnating in article growth. On smaller Wikipedias, the trend is positive, though slow. All open Wikipedias have more than 100 articles. The biggest of them is the Malagasy Wiktionary which has its growth kept by the use of Bot-Jagwar. Owned by myself, Bot-Jagwar runs from the Cloud, so it works regardless my computer and my internet connection’s healths. Thanks to it, the Malagasy Wiktionary gains 300 to 500 content pages daily. Automations eases many things in many ways, but automated processes can fail. So I have to keep an eye not only on the source code but also to entries generated thanks to that source code. African language Wikipedias are slowly but surely gaining articles as time passes. There seems to be a moratorium in closing African language Wikipedias, and this is fine because languages mainly spoken in developping countries need time to develop a community. Furthermore, the official language in these countries, especially African ones, are very often not the local language. An increase of bot-made articles (which constitute nowadays 20% of articles created in Wikipedia) can indicate that in a near future, perhaps in 25 or 30 years, a bot will be able to write article like humans do. This is because Ray Kurzweil predicts the ability to simulate the human brain to be possible in twelve years and that current computers’ calculation power were supercomputers’ in the 1990s. What about me? Well, it’s been a while since my last big article on the Malagasy Wikipedia. And according to the list of Wikipedias by sample of article, several hundreds of article needed in all Wikipedias are missing, so my first goal for Wikipedia is to fill these gaps, slowly but yet surely. I prefer contributing about geography, but as I am the only contributor of the Wiki, I have to fill gaps a bit everywhere : Biography, Chemistry, Sports, etc. At that pace, I can barely create three or four articles per day. At that pace, I can fill the 1,000 articles that every Wikipedia should have list whithin the year. It’s been a while since the last time I blogged in Malagasy, So this article will be followed by a Malagasy language article. Perhaps a translation of this one, perhaps a new one. To read further about what’s mentioned here. It’s been a while since the last article I wrote on this blog. This article is about the mass adding content on the Malagasy Wiktionary. The object of this post is to provide some explanations on why and how the Malagasy Wiktionary has become so big. But first, allow me to introduce myself. My nickame on all Wikimedia projects is Jagwar. I am a Wikimedia contributor since August 2008, and I am going to be 20 years old soon. I speak Malagasy as mother tongue, French as a second language and English as a foreign language (soon the third language, since it is not quite perfect yet…). When I discovered perfectly randomly Malagasy language, the wiki was virtually dead, with no one adding interesting content, and an active community mainly constituted by non native speakers. 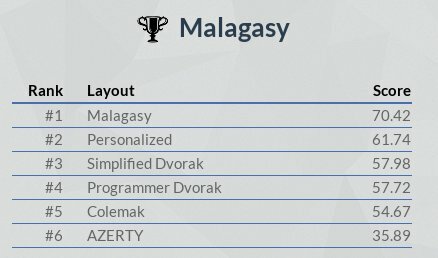 Without any knowledge of the rules of the wiki, with almost no knowledge of how to correctly write Malagasy, I began an article. It grew up to 20,000 characters, making it to be the biggest page of the wiki at that time. Bust infortunately (or fortunately, for the sake of readers), a non-native speaker administrator spotted the lack of notability of the article, leading it to be deleted. I could leave the wiki, as tens of hours of work had literally vanished of the wiki… But I didn’t, I still cannot figure out why, but deeper in my mind, a little voice told me to continue contributing. At that time, the Malagasy Wikipedia counted 550 articles, maybe less, but not more. So I continued on this way for a while. To help me in my task I wrote to potential volunteers. These people didn’t see the point to contribute to a wiki in their mother tongue: either they were unable to spell correctly Malagasy words, or they didn’t have time enough to do good work; while others required money to start contributing (times are hard in Madagascar, I know), and even with money, I am not sure these ones will stay long once the money paid. In October 2008, I discovered Malagasy Wiktionary. At the beginning I actually didn’t know what to do out there, so I continued to work on the Malagasy Wikipedia just to become more skilled and used to write Malagasy. In July 2009, I was on vacation to my fatherland: Madagascar. I have taken this occasion to learn deeplier the written Malagasy language, though my means were quite limited: reading newspapers, the Bible (I am christian), watching news broadcasts on TV as well as on Radio… I almost forget French (! ), though it was present almost everywhere as second official language. When back to France, I have decided to incite potential volunteers that are able to write to contribute on the Malagasy language Wikimedia projects: but you know, Madagascar was in crisis and people sometimes asked for money to contribute: other blamed me on my spelling mistakes, and others simply ignore the request. I had less and less time to dedicate to the projects and I have no money to give this way. One day, I decided that I couldn’t wait anymore for someone to arrive: the progress of my skills in Malagasy, in programming languages, and the promise of a very busy future (inducing a chronical lack of time) mentally forced me to do something, to do something for my mother tongue, even a tiny little thing. In 2010, when I could write in my mother tongue without too much spelling mistakes, I started to write bots. Once they are written, I ran them at the very full speed: fifty thousand edits per day: that was the pace, the normal pace. At the beginning it was the importation of foreign language wikis from other wikis, and it consisted mainly in importing verb forms, first through an import form, and after through a script that copy-pastes other wikis’ content pages to the Malagasy Wiktionary equivalent page. I went slightly at the beginning, but I did it more and more often, till the wiki got 200,000 content pages. On these possible coyright-infringing importations, I received a warning from a user that almost got his mother tongue wiki closed due to the creation of thousands of useless pages. In 2011, I got mad: after discovering the astonishing easiness of Volapük, I wrote a script to upload the word forms of that language. At full speed – i.e around 50,000 edits per day – three weeks were required to make the Malagasy Wiktionary the third biggest Wiktionary of the world. But months passed, and no one, absolutely no one, did contribute: one day on the wiki, the number of active users dropped to two, for a wiki that contains 1,19 million content pages (in comparison, the German Wikipedia which had a comparable article count, didn’t count less than 25,000 active users) ! On July of the same year, a new script has been written. That script allowed to create translations based on foreign language entries. With that script, up to 5,000 articles were created, and they mainly concern lemmata entries. Just a few weeks later, the import of all Malagaasy words has been completed. But its repercussion on article count was not visible due to the mass deletion of Volapük language entries. Why this mass deletion? Because many entries seemed to be wrong as they are not conjugation of verbs, but nouns (-.-‘), so the decision is taken to delete them all to re-create them later, with a better quality if possible. Since then, my activity on the Malagasy Wikipedia is put in brackets to dedicate my whole wiki time to the renovation of the Malagasy Wiktionary. During the summer vacation, I took the time to restructure the Malagasy Wiktionary. The article, category structure were inspired by the structure of the French Wiktionary: use of template for languages, parts of speech, allowed the Malagasy Wiktionary entries to be automatically categorised through the use of templates. Time passed and the routine started to install. One night, I discovered an online Malagasy monolingual dictionary. Having no idea about the copyrightability of the content (the copyright seemed to apply only on design), I decided to reuse the content on that dictionary to complete the entries on the Malagasy Wiktionary. The problem arrived just a few weeks later, when I received a mail from a Wikimedia Foundation staff member. P. Beaudette. In its mail, he asked me the origin of the malagasy language entries, I answered they were from various bilingual dictionaries, and the online monolingual dictionary… An copyright infringement investigation was led and my bot was blocked during the whole processus. At the end of it, I was told by the staff member to remove the 30,000 entries that infringe the original dictionary’s copyright, which was done. After this copyright infringement episode, I decided to orient my contribution in adding Malagasy language content to other wikis. But before that, I did some work on the Fijian and Tagalog Wiktionaries, that was more or less appreciated… There was in particular an IP address checking my contributions on the Fijian and Tagalog Wiktionaries. This IP told me to stop mass-adding content to these languages of which I speak no word. I ceased to work on both wikis a few weeks later, as the work is finished. But this mass-adding content, especially in language I didn’t speak at all, seemed to annoy people that have decided to discuss about the case on MetaWiki forum. No concluding results was given, and things were as they were before. With most of the hard work being removed, with a behaviour that has been reproved by many users, I decided to take a break of indefinite duration. It actually lasted 5 months, during which I tried to work on my written Malagasy outside Wikimedia projects. The progression of my skills, spelling as well as programming skills, were honourable, allowing me to go back again and make the Malagasy Wikimedia projects, and especially the Malagasy Wiktionary, evolve again. In July 2012, I built a new tool that allows me to know the non-exising entries/pages on the Malagasy wiktionary by consulting the daily online newspapers. Only two newspapers are currently supported, because of their use of RSS feeds. But the ability to make the script read non-RSS supporting websites is coming soon. In September, I have developped a new, improved translation retriever that allows the script to get all translations of all languages on a given page (the previous version could only translate one language at once), which almost decuples the translation harvest. This function is embedded in a XML dump reader that ampifies the efficiency of the script: fast translation retrieving and no requirement to be connected to the server while processing. Done every month, the dump processing and uploading make the wiki to gain more than 100,000 lemmata in a few months. These lemmata may have translation errors, but it is low enough not to be taken in consideration (<1%). Hardest cases can be resolved by a single check on the source wiki (which is indicated by a template). In October, I have thought about building a bot that completes a task as scheduled by a parameter file. This is particularly useful for maintaining list of wikis up-to-date. Currently, the pace at which the list of Wikis on the Malagasy Wiktionary is four times a day, i.e every six hours. At the end of January 2013, I thought about a more efficient use of the translation retriever that I wrote a few months ago. Then comes the IRC bot: it retrieves in real time all the edits made on selected wikis and does its possible to translate the latter entry in Malagasy, in real time! The first time it was developped, it only used the traditional translation retriever, but later, on March, it also features a basic entry processor that allows the IRC bot to also translate entries in foreign languages into Malagasy, using the same dictionary. This latter version of the IRC bot is currently in use, and it creates hundreds of entries and content pages on the Malagasy Wiktionary everyday. I have no precise idea about the error rate but I am pretty sure it is less than 5%. The positive side of the bot is its ability to keep the pace when several edits are made in a minute, nevertheless, as it requires to be online and to be connected to Wikimedia servers, the processing frequency is limited to one page per second. Something is being thought on allowing the bot to process more pages. Rehefa avy namboatra diksionera aho dia lasa namorona mpandika teny iray. Io mpandika teny io dia mandika ny teny anglisy amin’ny teny Malagasy nosoratana amin’ny alalan’i PHP izay mampiasa fisie *.txt ho an’ny rakibolana ary ny parser. Raha jerena ny resaka fitsipi-pitenenana ary ny filahatry ny teny ao anatin’ny fehezanteny, dia mbola lavitry ny afo ny kitay. Efa misimisy ihany anefa ny ezaka amin’ny famadihana ny toeran’ny mpamari-toerana ary ny anarana iombonana, araka ny hitantsika anatin’ity fehezanteny ity: “that beautiful woman is my wife” (vadiko ilay vehivavy mahafinaritra iny) izay nodikainy hoe “ity vehivavy mahafinaritra -ko andefimandry”. Ilaina fantarina ihany koa fa dikanteny iray ihany no fidian’ilay mpandika teny ao amin’ny rakibolana. Ka arak’izany izy io tsy miraharaha ny polisemia ananan’ny teny. Ny olana faharoa amin’ny fampiasana fisie dia ny filàna manokatra azy isaky ny dikan-teny, ka rehefa mahery ny 2 megaoktety ny totalin’ny haben’ny fisie rehetra sokafana dia miteraka hadisoana ilay dikanteny, izay manakana azy hanao ilay dikanteny eo amin’ny efa-joro. Ka ny fameetrahana banky angona no mety hahavaha izany olana izany.